interior? Well, it’s time for another step that will make this future Carnival Cruise Line’s addition even closer. Bookings for Mardi Gras inaugural cruises are open now! CCL announced an inaugural schedule for its Mardi Gras. The liner will take her guests on various 6- to 15-day sailings with stops in the ports of Europe and the Caribbean. She’ll depart on her maiden voyage on August 31, 2020 from Copenhagen towards Southampton. From there, on September 9, 2020, she’ll take a 14-day transatlantic crossing. This exciting adventure will end on September 23, 2020 in New York, from where Mardi Gras will depart on a 6-day round-trip with calls at the welcoming ports of Portland, Maine and Saint John, New Brunswick. 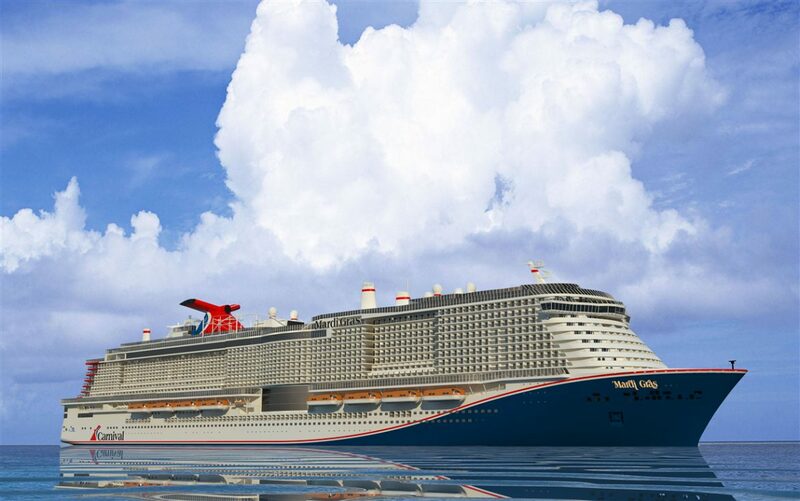 On September 30, 2020, the groundbreaking liner will take a 15-day Carnival Journeys voyage towards Port Canaveral, Fla.
On October 16, 2020, Mardi Gras will take a special 8-day Caribbean sailing, after which she’ll operate 7-day Eastern Caribbean and Western Caribbean voyages. Wow, are you ready for an exciting Mardi Gras inaugural season?